Most yachts store water in tanks and use pumps and plumbing to get acces to it. A smarter way is to store water in plastic jerry cans and once a week transfer water for daily use to one liter bottles and drink directly out of the bottles. Before I picked a calm day and used a funnel to transfer the water. Now I use a piece of tubing and siphon it. I use less than a liter of water a day, even in the tropics. 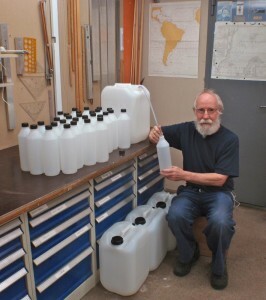 Using plastic jerry cans and plastic bottles makes it easy to keep track of how much water is on board. It is easy to keep the containers clean by rinsing them. Also it is a fool proof system. It is also light and cheap. Below is a picture with me and plastic bottles and jerry cans supplied by Emballator in Mellerud. I demonstrates how to siphon water, but of course even a child knows how to do that.